Political correctness will be the death knell for human civilization. Unless we ditch political correctness and speak freely without worrying about hurting anyone, our human civilization would fall. 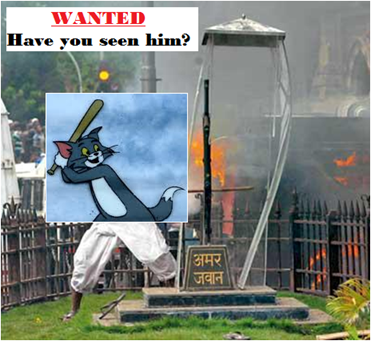 After Indian media channels failing to identify who was behind the arsons in Mumbai and Lucknow, TPI News has finally found out who were the people behind the arson. When arson was first reported, most Indian media channels reported 'unidentified mobs' being responsible the ruckus in these two cities. Most media channels are able to identify any arson activity carried out by Sangh Parivar, Shiv Sena, MNS or Akali Dal outfits. But when arsons are carried out by this particular group, media channels find it very difficult to identify the perpetrators. In all news reports, 'unidentified people' are accused of committing the crime. In a sensational revelation, it is now found that followers of Lord Voldemort or one-who-must-not-be-named were behind the riots. They are also known as ‘Death Eaters’ in JK Rowling’s Harry Potter series. This was revealed after TPI News conducted a sting operation on one of the media channel reporters. Apparently, followers of one-who-must-not-be-named also carry a special privilege of being 'those-who-must-not-be-named'. If media channels do name the 'ones-who-must-not-be-named', then Lord Voldemort's followers use violence magic to cripple media houses. 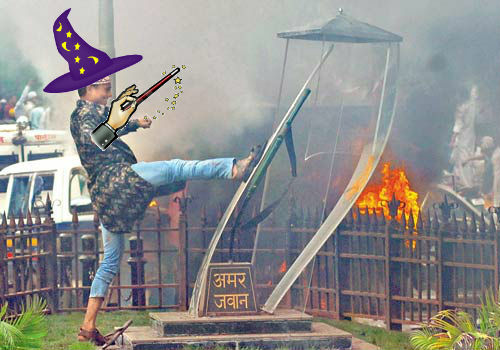 Those-who-must-not-be-named were demanding that India Harry Potter stop trying to throw Illegal Bangladeshis Death Eaters out. According to them, Death Eaters’ lives were in danger and Harry Potter was not doing enough to protect them, and was instead trying to throw them out of his school. It may be recalled that policemen were attacked with bricks and stones, and policewomen were molested in the attack by 'those-who-must-not-be-named'. Two followers of Lord Voldemort were also killed. 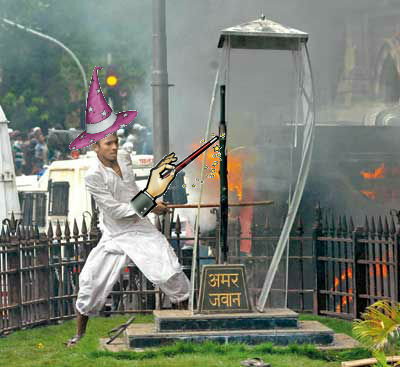 A follower of Lord Voldemort also attacked the Amar Jawan Jyoti memorial, triggering a nation-wide outrage. However, a few secular people stepped up and reminded everyone that just because one person who-must-not-be-identified attacked Amar Jawan Jyoti, all-those-who-must-not-be-named should not be blamed for it. So far, it was believed that Lord Voldemort existed only in the Harry Potter Series by JK Rowling. This sting operation has revealed that far from being killed, Lord Voldemort has increased his following and gives jitters to the mainstream media. 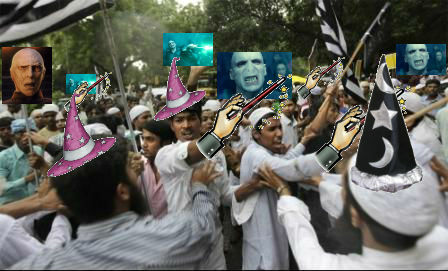 In the sting operation, it was also revealed that the 'unidentified mobs' carry guns magic wands and special skull pointed magical caps that give them special political magical powers. These magical powers apparently make them 'unidentifiable' or make them 'not-be-named'. The 'unidentified' follower of Lord Voldemort who attacked the Amar Jawan Jyoti, when captured on secular camera by secular media channels appeared like the cartoon character Tom from the Tom & Jerry Series beating the hell out of Jerry. Exposé of AAP's "Modi exposé"
Modi Did Nothing for Gujarat. It Was Already Developed. आप(AAP) से पूछे जाने वाले सवाल क्या वाकई में फालतू हैं? Is supporting Arvind Kejiriwal necessary for Jan Lokpal?